After adding an object to Unigine, you can control its transformations with your control devices. This article shows how to control basic object movements and combine different transformations. An article on Matrix Transformations. An article on mat4 and dmat4 Unigine data types. A direction vector is an important concept of mesh transformation. To move the node forward, you should know where is the forward direction of the mesh. 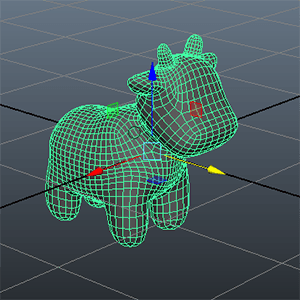 When the mesh is exported from a 3D editor, it saves the information about the forward direction. And when you add the mesh to the Unigine, it will have the same orientation as it had in a 3D editor. On pictures given above, the direction vector has positive Y-direction. To move this mesh forward, you should get the direction of the mesh by using the Y component (the second column) of the world transformation matrix of the mesh. The point is that content creators and programmers should make an arrangement about the direction vector. This section contains different ways of setting the forward movement of the mesh. In this example, we used the "p" key pressing to move the mesh forward. The direction vector is visualized for clarity. The new position can be also set by using the setWorldTransform() function. The following examples contain the code from the update() function of the AppWorldLogic class. The part of controls initialization is the same for this method, the difference is in the update() function only. // check if the control key is pressed. 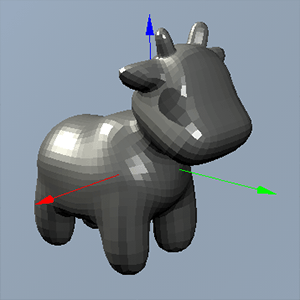 This section contains implementation of the mesh rotation. In the example above, the node is rotated to the left by pressing the "o" keyboard key. Combining different movement controls is not more difficult than adding only one movement control. The following example adds a mesh to the world and allows you to control it. You can rotate the mesh by using the "o", "[" keyboard keys and move forward by using the "p" key.